Are you cognizant of this? All the mysteries in your daily life? Do you stop and see yourself and your surroundings from above? This can give you a little detachment. Make you “see” better — even if no answers are available. This is my crusade now. To stop seeking. Stop looking for answers. Even though I do this for a living and it’s become second nature. I get SO OBSESSED with answers. What are they, where are they? This is so Virgo and I am not a Virgo Sun but compulsively Virgo. Moon Pluto conjunction in Virgo. Always thinking ruminating chewing chewing chewing. Mercury opposes Neptune: this is a BEAUTIFUL poetic aspect. Oppositions require meeting in the middle. Not too much Neptune snow globe. Not too muchVirgo slice and dice. Poetically prove your point 🙂 Caution: foggy glasses and contracts signed in invisible ink. Mercury brings much needed understanding to your Pisces house and issues. Moon in Cancer opposing Pluto and squaring Uranus. Extra hugs all around. And cake. There shall be cake. Mercury trine Pluto: your words are dangerous and deep. The trine *should* keep you from hurting feelings but still take care. The Virgo/Cap combo is mega clinical. Point words and brain at problems needing to be solved, not people who supposedly need fixing. SUN ENTERS VIRGO! Time to harvest. What has grown in your life? A card for Virgo Season: interesting! It’s the end of Leo Season and I get a fiery card! 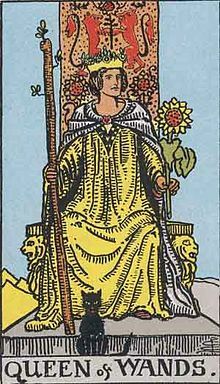 The Eight of Wands. Brace yourself! Many of you will take flight this fall. This one in this direction! That one in that direction! Life as you know it? Changing. Not for everyone, no, but for enough that this card came through. The Stars Today: Mom vs. Dad!